Fraction Math Games Make Learning Fractions Fun. Fraction math games make learning fractions fun and exciting for kids and also boost confidence. What if you could get kids captivated by math so much they don't even realize they are learning? Wouldn't that be great? Object of the game: Be the first player to score four in a row. Print one game board for each player. Click to print game board. Print one list of possible sums for the group. Click to print list of possible sums. Print the fraction combination cards and cut apart. Click to print fraction combination cards. Place face down on the table. Each player writes any of the possible sums in the spaces on his blank game card. He may use all of the sums just once, or use some more than once and not use others at all. Each space of the game card should be filled. Players should know that many of the sums are used for more than one fraction combination. For example, 1/2 is the answer for 1/8 + 3/8 and 1/4 + 1/4. The first player to complete step one starts the game. The first player takes a fraction combination card from the top of the pile. He calls out the combination. Each player writes this on his paper, adds the fractions, and writes the answer in lowest terms. Any player who has this sum on his game card covers the space with a marker.Note: Players may only cover one space per turn. For example, suppose Jim has written the sum of 3/4 on his game board in two places. He takes the card that says 7/8 + 7/8. He adds and finds the answer is 3/4. He may cover only one of the spaces on the game board with that answer. The next player takes a fraction card, reads it to the players as in Step 3. 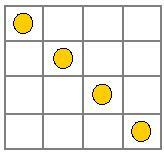 Play continues until one player has covered 4 spaces in a row, vertically, horizontally or diagonally. He calls out, “Four-Sum,” and play stops. The other players check his answers with the used fraction cards to be sure he marked the correct spaces. If the answers are correct, that player wins the round. If 1 or more of his answers were incorrect, he must clear his board of all markers, and the round continues until a player wins. Use more fraction cards and 5 x 5 game boards for a longer game. Use harder fraction cards (with unlike denominators, three addends, etc.) for older players. © 2009 www.learn-with-math-games.com All rights reserved.Now, if you had tons of different fun fraction math games, you might be well on your way to turning them into math maniacs. I'm sure you might not mind so much if you see better grades and their confidence in math skyrocket. Fraction math games should really be a part of a child's overall math learning experience. More and more teachers and parents are realizing the value of making math fun for kids. If you can capture their attention, that's most of the battle right there! Visualize Equivalent Fractions with these fraction strips. Printable board game teaches adding and subtracting fractions with like denominators. Play Fraction Number Line Concentration. Also print off number lines with fractions.